Last week Marian Armitage, who is currently writing a Shetland cook book, came to the office to speak about her ideas for A Taste of Shetland blog since she is one of the contributors. Marian is a Shetland but funnily I met her in London last May, at A Shetland Night in London. And since then we’ve kept in touch. One of Marian’s posts on A Taste of Shetland was about making the best of the glut of rhubarb at this time of year and making Rhubarb, Ginger and Orange Jam which sounded delicious. The great thing was that Marian brought a jar of her jam with her so I had a chance to taste it. Orange peel makes a lovely addition to the preserve and since there is still plenty rhubarb in the garden and I like the idea of ‘free’ food I decided to make my own batch. 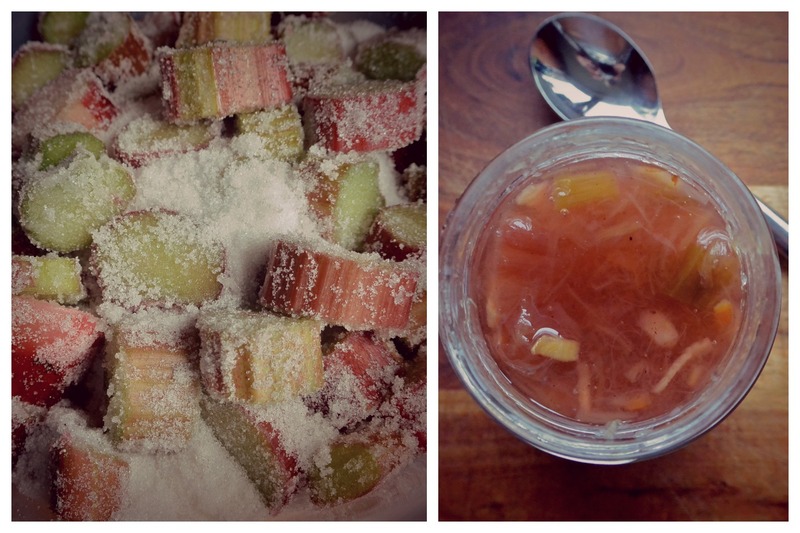 Tip the rhubarb pieces into a large bowl, along with the sugar, ginger and vanilla powder. Leaving the mixture sit for 2 hours, turning with a spoon every 30 minutes. Once most of the sugar has dissolved, tip the contents of the mixing bowl into a large sauce pan and bring to a brisk boil. Boil the orange peel in a small amount of water for 20 minutes, strain and add to the rhubarb mixture. Turn the heat down and simmer for approximately 40 minutes, until the rhubarb has broken down. Transfer the jam into sterilised jars, seal and leave to cool. Store in a cool dark place, once open in the fridge.